Julia V. Pugh, 99 of Plains Township, passed away Monday morning, November 5, 2018 at Hospice of the Sacred Heart, Dunmore, PA.
Born in Barnesboro, PA, she was the daughter of the late John & Justina (Prokopy) Veliky. Julia attended Sacred Heart High School, Plains, and was employed as a floor lady at Kingston Juvenile Baby Furniture, until her retirement. She was a member of Saints Peter & Paul Church, Plains, and enjoyed traveling with her late husband, Leo. Julia also loved camping at Keen Lake, Waymart for over 30 years. 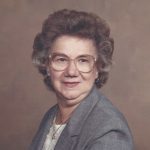 She was preceded in death by her husband Leo J. Pugh on December 5, 1982, sisters Mary Butch, Helen Shuleski, and Anna Evans, brothers Joseph, Stephen, John, and Peter Veliky and John Prokopy. Surviving are her daughter Rita DePasquale, Plains, son Leo Pugh and his wife Rose, Pringle, grandchildren Guy DePasquale, Leslie Gabriel, and Delenna Kabalka, great-grandchildren Julia Gabriel, Jadon DePasquale, Mick and Emily Kabalka, numerous nieces and nephews. Funeral services for Julia will be held Friday, November 9, 2018 at 7:00 pm at the Corcoran Funeral Home, Inc., 20 South Main Street, Plains, PA 18705, with Father John C. Lambert, officiating. Private interment will be held in Sacred Heart Cemetery, Plains. Family and friends may call Friday from 5:00 to 7:00 pm at the funeral home. Memorial donations may be made to Hospice of the Sacred Heart, C/O 600 Baltimore Drive, Wilkes-Barre, PA 18702.